Christian greetings in the precious Name of our Lord Jesus Christ who will build faith in you as you "receive the word with all readiness of mind, and then search the Scriptures whether those things are so". The enemy within the gates has Pavlov's Goyim dogs of the colonies of their City of London barking mad up the wrong tree hunting for deceased Mr. Osama bin Laden (aka CIA employee Tim Osman), chasing around the world for terrorists, when it is the terrorists that control the US, British, Australian, Canadian and other militaries on this insane witch hunt. And no one has the courage to expose this alien 'hidden hand' because they have enacted legislation making exposure taboo. If the same Spirit that raised Christ from the dead dwells in you, you will not fear to expose evil. To understand the hidden masters of the Presidents' CIA, of presidents and other world leaders themselves, and the interlocked Intelligence agencies of most countries, one must start with the Secretary of State for Queen Elizabeth I, Sir Francis Walsingham (1530-1590), who established MI6, then work forward to the present day. 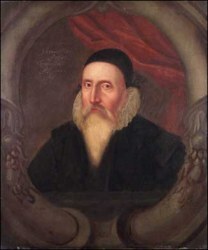 Her Astrologer Royal, Cabalistic Jew and original "agent 007" portrayed at right, John Dee (1527-1608), devised the British Israel/Christian Identity concept, uniting Jewish money with British Imperialism to plan the Empire of the City of London and occult foundation of the New World Order, falsely believed to be the "British" Empire. This Machiavellian guile continues under Dee's kinsmen who hold dominion over the Israelites and also over our (once) Christian nations as prophesied by Isaac. Al-CIA-da, Taleban, Jemaah Islamiyah and related false flag operations generate chaos designed to expand the "Empire of the City of London" with usury borne by Goyim taxpayers, leading to their exhausted pleas of "Peace! Peace!" under Lucifer's totalitarian one world government as called for in Protocol 10.19. In 1962 Brother Branham said, "This present government now is spending . . . tax money that they'll be collecting forty years from now. She's done . . . they're spending and trying to buy foreign. . . Why, they're just giving it out any way. Don't you see that's exactly what they're going to do? Now, if this nation goes busted, the only thing it can do is go. . . bankrupt. That's the only sensible thing to do: change the currency. But they won't do it. Under this present ministration, Roman Catholic church owns the gold of the world, and what they'll do is sell out. These rich men and so forth of the earth, as the Bible said, . . They'll accept that and they'll take the money from Rome, and then she's sold her very birthright. 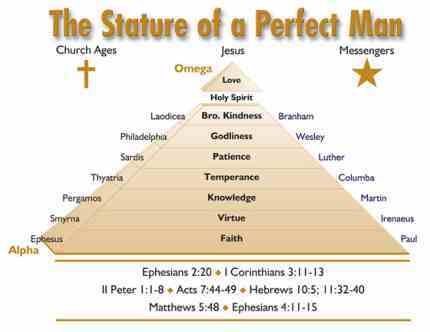 . ." (Stature of a Perfect Man, p. 53:391-392). Revelation 16:12, "The sixth angel poured out his vial upon the great river Euphrates; and the water thereof was dried up, that the way of the kings of the East might be prepared." The US productive economy is now offshore in the hands of the "kings of the East" who hold a lien on the United States. America is "naked . . . and knows it not" (Revelation 3:17). As per the World Heritage Treaty much of her land is bound up with the UN, and under the Programme of Action of the "Earth Summit Agenda 21" the United Nations Conference on the Environment and Development-UNCED, "set up the global infrastructure needed to manage, count, and control all of the world's assets. Included are the forests, fresh water, agricultural lands, deserts, pastures, rangelands, farmers' fields, oceans and inland waterways, marine environment, marine life, cities, housing, sewer and solid wastes, methods of production, air, pollution, biotechnology-every aspect of living-farming, production and manufacturing, research and medicine, etc., along with you and I. Today everything is sustainable: sustainable water, sustainable forests, sustainable markets, sustainable agriculture, etc." "Through advanced technology such as the Geographic Information System (GIS), the control, count and management of the earth's assets is being implemented. Scientists have told me that the GIS satellites can measure the quality of soil anywhere in the earth to a depth of three inches. Furthermore, it can tell you what kind of birds and insects are in which kind of tree. It can also see you and me sleeping in our beds and living in our housesever wonder why leaded paint was such a problem. The UN calls this transparency. . ." (Joan Veon, Sustainable Development, Agenda 21 and Prince Charles). They will tax you for the rain that falls on your farm, limit the amount you may store, instruct you as to how you will use your property, and if you have spare bedrooms, they will fill them for you. . . in the interest of a sustainable world. Yes: 85% of the federal budget went to pay for war, disease and debt. That should tell you all you need to know about the future of this nation: the US is about to become history. No nation can spend 85% of its budget on war, disease and debt and survive for more than a few years. Rome spent far less on war and could not maintain its republic. The US is so bankrupt, waging war will soon no longer be an option but a necessity (Revelation 13). George II has done what the terrorists, and there were none before the City's USrael proxy created them, could only have dreamed of doing: destroying the wealth and independence of the world's most powerful nation and watching it implode under the weight of its own debt. Meanwhile, this Church has been freed from the grasp of our persecutors but I must appear before the Federal Court again on February 8. Please remember this matter in prayer. Forensic investigator Joe Vialls, was a man who knew too much. Too much for "the City." Now he is "the late" Joe Vialls (but the man who played the part of Joe Vialls remains very much alive. Over two years ago Newsletter 400 published links to investigations by Joe Vialls and others indicating that aside from a few Muslim patsies set up to create a diversionary blast (after the proven pattern of 9/11, 7/7, the Madrid railway, Djkarta and other bombings), the Bali Bombing in 2000 was not a Muslim affair. However, the 1871 script for World War III, is set in concrete and calls for a controlled conflict between innocent Islam and the political Zionists. Like Germany in two World Wars ("Hitler does not want war, but we will force it on him. England will have the last word, just as it did in 1914"  Emil Cohn, Les Annales Magazine, USA, 1934), Japan in World War II, and more recently Vietnam, Iraq and Afghanistan, the Muslim people do not want war, but it is being forced upon them. Comment: As it was in the days of Noah the wickedness of man is great on the Earth, and every imagination of his heart is only continuous evil (Genesis 6:5; II Timothy 3:1-5). Are you a Christian in the liberty of Jesus Christ, or an unthinking brain-controlled zombie? January 28, 2008  The dependence of the US government and military on computer systems, which run on software provided by outside vendors, is the Achilles' heel of the world's most powerful nation. 9/11 was clear proof of that fundamental weakness and vulnerability. 9/11 was a computer crime. Apart from being a monstrous crime of mass murder and false flag terrorism, 9/11 was also a sophisticated computer crime, carried out through long-term foreign infiltration of the most sensitive US military and government computer networks. This infiltration, carried out by a foreign intelligence agency, gave the perpetrators of 9/11 "real-time" access to all the data on the computers of the US government and military. On 9/11, this "super-user" access to the data of the most critical government computer networks gave the terrorists the ability to thwart the military response to the emergency as it developed. January 24, 2008  Amid the controversy brewing in the Senate over Foreign Intelligence Surveillance Act (FISA) reform, the Bush administration appears to have changed its strategy and is devising a bold new plan that would strip away FISA protections in favor of a system of wholesale government monitoring of every American's Internet activities. Now the National Director of Intelligence, Mike McConnell, is predicting a disastrous cyber-terrorist attack on the US if this scheme isn't instituted. . .
What if we treated it as if we couldn't live without it? This is something to make you go. . . hmmmm. . . where is my Bible! Oh, and one more thing. Unlike our cell phone, we don't have to worry about our Bible being disconnected because Jesus already paid the bill. Makes you stop and think, "What are my priorities?" Comment: Gulp! I do not own a cell phone. In Genesis, the names nearly all express a nature or relationship. Adam's naming of the animals implies his power of speech, distinguishing him above them, and his knowledge of their characteristics as enabling him to suit the name to the nature. God, in calling His elect into a new and close relationship with Himself, gives us a new name and we grow into a new nature. When Abram finally overcame, God gave him part of His Name, Elohim, as a suffix in surety of the promise. As the Father of all creation He was making Abraham the father of faith to the elect of "all families of the earth" that are in Adam's race or "Father of the Gentiles" and not his natural seed alone (Genesis 12:3; 17:5). Elohim is a plural word for angels, gods and persons of authority. However when applied to the One true God it expresses the fullness of all Divine perfections in their manifold powers and operations, which the heathen divide among a variety of gods as in the Trinity. Elohim concentrates all the Divine Attributes assigned to the idols severally, and besides these, others which corrupt man never of himself imagined, infinite love, goodness, justice, wisdom, creative power, inexhaustible riches of excellence; unity, self-existence, grace and providence signify He is the sum of all deity. From Genesis 2:4  3:22 Jehovah-Elohim are combined showing that the mighty Creator is the same Jehovah who revealed Himself to Adam as subsequently He revealed Himself to Moses. Again, in Genesis 5:29, He reveals Himself to Noah as Jehovah, making Noah a second depository of the covenanted promise. And in Genesis 14:18-22 Abram identified El Elion, "Most High God," with Jehovah. "I lift up my hand to Jehovah, the most high God, possessor of heaven and earth". In Exodus 6:2-3, "God said to Moses, I am the Lord ("Jehovah," the self-existent One, the Covenant-keeping God): I appeared to Abraham, to Isaac, and to Jacob, by the Name of God Almighty ("El Shaddai"), but by My Name Jehovah was I not known to them." Jehovah is a proper name restricted to the One true God in covenant with His people, and therefore the predominant Name in passages concerning them. Hence the Name of our Redeemer is Lord Jesus Christ, Jesus meaning "Jehovah-Savior" who is called Emmanuel, meaning the One person of "God with us" (Matthew 1:21-25; Isaiah 7:14; 9:6). To paraphrase, "I was manifested to Abraham as the all-mighty One, able to accomplish all I promised; but in My character of Jehovah, the unchanging I AM, the fulfiller of My covenanted promises I was not in act made known, as I am now about to make Myself known to My people Israel." The key word is manifest. As we see in the transition from Jehovah to Jehovah-Elohim to Jehovah-Savior, God's Names describe His manifestations, acts, offices or revelations of Himself. As the eternal Spirit He could not fulfill the requirement of kinsman Redeemer and pay sin's penalty of life for life, so He created a body by the spoken Word in the womb of the Virgin Mary who received the Word by faith (Hebrews 2:9). Every time a victory is won or a new revelation is given, a name is changed as in baptism, for your name characterizes your life. When they had overcome, Abram became Abraham, Sarai became Sarah; Jacob became Israel, and Saul became Paul. In the Old Testament the mother of the patriarchs uttered the name of her child under inspiration while in labor. The name prophetically described their nature and destiny as a consequence of their character. Jacob's prophetic blessing told the destiny of the elect Israelites of each tribe in the Messianic time of completion in Daniel's Seventieth Week wherein they will pass from nature to grace, yielding human disposition to Divine guidance (Genesis 49:1; Isaiah 2:2; Ezekiel 38:8). The name was given to the child at the time of his circumcision, because he then entered into a new covenant relationship to God (Luke 1:59-63; Luke 2:21), so Spiritually, God's endowment of a new name implied His bestowal of a new nature. Revelation 2:17, "He who has an ear, let him hear what the Spirit says to the true Spiritual Church (in revelation and blessing), and to the nominal church (in reprimand); to everyone who overcomes and is victorious I will give some of the hidden manna (revelation), and a white stone, and in the stone a new name written, which no one else knows except the one who receives it." A stone is a rock, symbolizing a witness or revelation, so a white stone signifies the acceptance of the individual by virtue of his pure revelation of the Word for his hour. Simon's name, which meant "harkening," was changed to Peter, which means "rock or stone" because he possessed a clear revelation of who Christ is (Matthew 16:13-20). Jesus said, "You are Peter, and upon this rock of the Spiritual revelation of who I AM I will build My Church; and the gates of hell shall not prevail against the rock of faith. And I will give you the keys of the kingdom of heaven: which is the revelation that will grant the new birth." (As He told Nicodemus, "Unless one is born-again of water and of the Spirit, (John the Baptist baptized only with waterMatthew 3:11; John 1:33) he cannot understand and enter into the kingdom of God" (John 3:3-8). "For the kingdom of God does not come by looking for it; neither will men say, Look, here it is! Or, over there! For the kingdom of God is a revelation within you" (Luke 17:20-21). We enter into the Kingdom by faith without of seeing it). "And whatsoever you bind on earth shall be bound in heaven: and whatsoever you loose on earth shall be loosed in heaven." A 'third pull' promise! At your new birth you were circumcised in heart and ears by a clear revelation of the Word for your day, and can never more commit sin (or disbelieve) the revealed Word of God because the revelation remains in you (I Peter 1:22-23; I John 3:1-9; 5:18; Revelation 13:8). Everyone who overcomes and is born again receives a new name like Abraham and Sarah. Our new name is in the white stone or revelation of the Message for our day; not our personal name but the compound redemptive Name of our God, which is Lord Jesus Christ (Revelation 3:12; John 5:43). By the invisible marriage union we become Mrs. Lord Jesus Christ; that is, we are Christians. Now anyone may declare themselves to be a Christian, but only one with the revelation can truly discern the claims of others or know whether or not they themselves are in the faith, which is to own the new Name it contains, for the revelation and the Name are one and the same. You can share your revelation, but only those who are also elect will be able to receive and live it. When we are born-again we are baptized into the Name or revealed nature of the Lord Jesus Christ and display the Token for our day. II Peter 1:4, "By His Divine power of revelation He has given us exceeding great and precious promises: that by these you might be partakers of the divine nature, having escaped the corruption that is in the world through lust." If you read through this chapter to at least verse 8 you will see the virtues of the nature of Christ manifest by the PART-Word Body in each of the seven Church Ages, "built upon the foundation of the apostles and prophets, Jesus Christ being the Chief Corner Stone" of love that completes the pyramid (I Corinthians 3:11-13; Ephesians 2:20). As Brother Branham expounded in Stature of a Perfect Man, faith, virtue, knowledge, temperance, patience, godliness, and brotherly kindness are capped by love in the end-time Bride. If you study the meaning of the names of each of those Church Ages you will discover they reflect the nature of the Age. One can be a Lutheran, Anglican, Baptist, Methodist or Pentecostal, impersonating a part of the Body that is already made up; Jesus called these "blasphemous names" (Revelation 13:1). But if one can overcome church creeds and the world he will become Mrs. Jesus Christ. If we are Attributes of God's eternal thinking and members of the Family of God, like Brother Jesus we must bear the Name of our Father (John 5:43; Acts 2:38). God's Name is in the Logos, because He is the Word, and the Word interpreted is the manifestation of the Name of God (II Corinthians 3:2). "By one Spirit we're all baptized into one Body," and that Body is a family, the Family of God. And that's the House of God, and the House of God is the Name of Jesus Christ. "The Name of the Lord is a strong tower: the righteous run into it, and is safe." How are you going to come into Christ by a titleFather, Son and Holy Ghost? This new stone makes your heart tender towards God and man. You are no longer a legalist trying to work your way to heaven like Israelites under the Law for whom God's Word was written on tablets of stone deposited in the Ark of the Covenant, but your heart has become the Ark in the Holy of Holies above which He is enthroned, leading and guiding you from within. God told Israel, "After I have taken you from among the heathen, and gathered you out from all countries, and brought you into your own land. I will sprinkle clean water upon you, and you shall be clean from all your filthiness, and I will cleanse you from all your idols. I will also give you a new heart, and I will put a new spirit within you: and I will take away the stony heart out of your flesh, and I will give you a heart of flesh. And I will put My Spirit within you, and cause you to walk in My statutes, and you shall keep My judgments, and do them. And you shall dwell in the land that I gave to your fathers; and you shall be My people, and I will be your God" (Ezekiel 36:25-28). When will this Scripture be fulfilled for Israel? In the midst of Daniel's Seventieth Week after the elect Israelites have been gathered out from the nations into the Promised Land in the time of "Jacob's trouble," also known as the great tribulation, when the nation of Israel is born-again in one day, all 144,000 of them. This manifests the folly of British Israel/Christian Identity theology, which is a Jewish hoax and as Moses testifies, Jews are the sworn enemy of Israel (Genesis 27:39-41; Deuteronomy 7:1-3). On the day of His circumcision the virgin-born child was named Jesus, meaning Redeemer. At the age of about thirty John baptized Him in the Jordan and God announced that He was His temple or dwelling place made without hands, anointing Him with the Shekinah in the form of a dove. His Name was now the Christ, or Jesus Messiah. When He overcame in the garden of Gethsemane His Name was changed again, and He became Lord. He is Lord Jesus Christ. We pray and do all things in God's compound redemptive Name, or we do not expect an answer to prayer (Acts 4:12; Ephesians 5:20; Colossians 3:17). When He conquered death and hell, overcome them and ascended on high, He received a new Name. Matthew 28:18, "Jesus came and spoke with His disciples, saying, all power is given unto Me in heaven and in earth." That makes Jesus the manifestation of El Shaddai, the Almighty God. Revelation 19:13-16, "And He was clothed with a vesture dipped in blood: and "His Name is called The Word of God (just as He is called "Emmanuel," for He is the Logos). "And the armies which were in heaven followed Him upon white horses, clothed in fine linen, white and clean. And out of His mouth goes a sharp sword, that with it He should smite the nations: and He shall rule them with a rod of iron: and He treads the winepress of the fierceness and wrath of Almighty God. And He has on His vesture and on His thigh a Name written, KING OF KINGS, AND LORD OF LORDS" (Isaiah 63). A new name or office for a new manifestation. He is Melchisedec, King of Righteousness, King of New Jerusalem, which means King of peace (Hebrews 7:1-3). Revelation 3:12, "He who overcomes I will make a pillar in the temple of My God, and he will go out no more: and I will write on him the Name of My God, and the name of the city of My God, which is New Jerusalem, which comes down out of heaven from My God, as well as My new Name." When all becomes new there will be no temple in the City "for its Temple is the Lord God Almighty and the Lamb" (Revelation 21:22). We are pillars in this temple, which means we are a part of the foundation, which is Jesus Christ (I Corinthians 3:11). As we have taught, the Bible is the story of God changing His form from the eternal Spirit alone with His thoughts into the flesh of His glorified Family. We are the New Jerusalem and will be overshadowed by the Shekinah throughout eternity. Together with our Husband and Lord we will be worshipped throughout eternity as God manifest, so let us be written epistles of our part of the Logos, known and read of all men to the glory of God. I have been asked, "If Jesus is God, and God is not two people, to whom did Jesus pray"? Jesus said to Nicodemus, "If I have told you earthly things, and you believe not, how shall you believe, if I tell you of heavenly things? And no man has ascended up to heaven, but he that came down from heaven, even the Son of man who is in heaven" (John 3:12-13). As the eternal Spirit God could not meet His requirement of a near kinsman because neither the Jews nor the Hebrew people nor the Romans could put a spirit to death, and a spirit is not kin to man, so God condescended to become Man in the virgin born manifestation of the Word or Logos of God (John 1:1-14). Isaiah and the prophets understood this. Isaiah 44:6, "THUS SAITH THE LORD the King of Israel, and his Redeemer the Lord of hosts; I AM the first, and I AM the last; and beside Me there is no God." John the Divine and the angel Brother Branham who led John through the visions on the Isle of Patmos took Jesus at His Word. Revelation 1:8, 17, "I am Alpha and Omega, the beginning and the ending, says the Lord, which is, and which was, and which is to come, the Almighty" (El Shaddai). . . "and He laid His right hand on me, saying, Fear not; I AM the first and the last." Jesus of the New Testament is Jehovah of the Old. Like every Christian, Jesus the mortal Man was praying to the God dwelling in Him. Jesus is the beginning of God creating Himself a part of creation just 2,000 years ago by faith in His spoken Word. His wife is the continuation of the same creation as Eve was the continuation of the first Adam, and in the new heavens and new earth the "saved" will worship God manifest in the glorified flesh of Jesus Christ and the Bride of all Ages, which is God made manifest. John 8:58, "Jesus said, Truly I assure you, Before Abraham was, I AM." Jesus is the Logos or expressed mind of God of which Abraham was an Attribute (Colossians 1:15-19). Revelation 22:16, "I Jesus have sent My angel (William Branham  Revelation 1:1; 10:7, etc.,) with this testimony for the churches. I am the Root and the Offspring of David, and the bright and morning star." Jesus can only be the root and also the Son of David if He is the Logos? Quoting Psalms on the day of Pentecost, Peter testified to a crowd of over three thousand. Acts 2:34-39, "The Lord said to my Lord, Sit on My right hand, until I make Your enemies your footstool. Therefore let all the house of Israel know assuredly, that God has made that same Jesus, whom you have crucified, both Lord and Messiah." "Now when they heard this, they caught the revelation, and said to Peter and to the rest of the apostles, Men and brethren, we've committed deicide, what must we do to be saved? Then Peter said, Repent, and be baptized every one of you in the Name of the Lord Jesus Christ for the remission of sins, and you shall receive the gift of the Holy Ghost. For the promise is to you, and to your children, and to all that are afar off, even as many as the Lord our God shall call. . ."
Israel knew from the Prophets that Messiah would be God manifest, not a second or third person. The Shema, which they constantly recite, says "Hear O Israel, the Lord your God is one Lord" (Deuteronomy 6:4). And the First Commandment states, "I AM the Lord your God . . . you shall have no other gods before Me" (Exodus 20:2-3). Yet David called Jesus Lord, and on the day of Pentecost they recognized Jesus is "both Lord and Messiah".